Marion Kane is a food columnist for the Toronto Star newspaper. 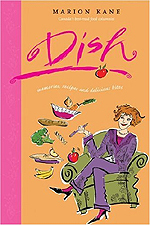 She's just published a book of her favourite columns called Dish: Memories, Recipes and Delicious Bites. It's published by Whitecap Books. To purchase this book via amazon.ca, just click on the cover pictured here. And if you're in Stratford, Ontario, (Marion's new home town) make sure you check out Ken's French Fries, parked in front of city hall, and Cooking Up A Storm, a cookbook store, which also sells kitchen gadgets and vintage kitchen collectables. To listen to my entire conversation with Marion, download my latest podcast here. On two acres of land near downtown Victoria, Corry Matechuk and Darren Brown specialize in naturally-grown fruits and vegetables. This program explains how they work directly with chef David Mincey of Camille's in Victoria to provide him with the fresh ingredients he considers a vital part of his menu.